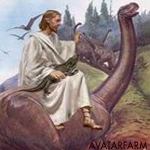 Can a young earth creationist be a legitimate scientist? I saw this article, and thought it would make for interesting discussion. I don't know what to make of this guy. He really seems like a complete fraud in that he is basically putting forth research that he himself believes to be wrong. This relates to a post I made to 'Chosenby Pasta' just now. Academia is full of well-meaning frauds. The entire doctrinal system selects for obedience and subordination to a particular ideology at an almost unconscious level (somewhat akin to Darwinian selection). This has been true throughout most of history. In this clip Chomsky gives the example from WWI (as it is far enough away for us to have some objectivity). The same applies in many other fields. May Zeus be with you.